The National Institute on Drug Abuse (NIDA) lists 13 steps of effective substance abuse treatment; among them, noting that addiction is a disease of the brain, treatment must be readily available, and no one form of treatments works for everyone. Also, remaining in treatment for an adequate period – which NIDA states should be at least 90 days – is essential to recovery. For many people, medically supervised detox and rehabilitation are the primary steps, but not the only steps, toward recovery. It is important to know that recovery should continue after the individual completes a rehabilitation program. For many, support groups are free sources of encouragement in recovery that offer new friends and emotional support. The concept of support groups, which are also sometimes called self-help groups and mutual support groups, involves peers discussing issues and offering emotional validation and self-care tips, with guidance from a leader who is not a professional doctor or therapist. While working with physicians and therapists is an essential part of recovery, spending time with those who understand the individual’s struggles is also deeply important. Support groups help those who are actively recovering from addiction, as well as friends and family of those overcoming substance abuse. Many people may, at first, confuse support groups with group therapy. While both offer important discussion among people going through similar issues, like overcoming addiction to drugs and alcohol; group therapy is typically guided by a trained therapist or counselor; support groups, on the other hand, are led by peers who may or may not have some training in leading the group, but who are, more importantly, people who have also gone through the recovery process. Support groups are typically small. They meet on a regular basis, usually once or twice per week, to discuss issues that have come up in that time and review new thoughts on the concerns brought up from the previous meeting. It is important to note, however, that support groups are not a replacement for therapy. Working with a therapist and attending a support group at the same time, especially for mental health issues associated with addiction, is the best combination for long-term recovery. For many, the ultimate goal of recovery – as much as there can be a conclusion to the process, which is a lifelong goal for most – is to maintain abstinence while gaining stability and returning to active participation in one’s community. Support groups are an essential part of the transition from rehabilitation, which focuses on therapy, to being a productive part of society. Support groups are a place for people in recovery from addiction to discuss their ongoing experiences, fears, and successes. The individual is surrounded by likeminded, healthy peers; from before rehabilitation may still struggle with addiction or may trigger relapse. The individual can voice their concerns, struggles, and fears without judgment. The individual gets “healthy peer pressure” from the group to focus on sobriety and overall wellbeing. The individual has new friends and confidantes that can be reached in the event of a personal crisis. As the benefits of peer support for long-term recovery become more apparent, researchers are examining exactly how effective these groups can be. A meta-analysis of peer support in the treatment of addiction, published in 2016, examined 10 studies from 1999 or later. There are several distinct types of peer support groups for abstinence in various locations, but many of them, according to the 2016 analysis, dramatically improve recovery. For example, the reviewed Recovery Association Project (RAP) found that, at a six-month post-rehabilitation follow-up point, 86 percent of those who attended support groups in some form had been abstinent from drugs and alcohol in the previous month, which is much higher than the general recovering population at that point in their process. These participants also reported a high rate of satisfaction with their support group. Other studies in the meta-analysis reported more general findings of greater success maintaining abstinence among support group attendees, but no specific percentages. A slightly older analysis published by the Office of Veterans Affairs (VA) found that veterans who worked to overcome substance abuse, and who attended support groups as part of their recovery, reported greater success abstaining from drugs and alcohol – not just at the six-month mark, but at the first, second, and even third year after recovery. However, attending a support group regularly had much better results than sporadic attendance or dropping out after a few months; among veterans who left before one year, or who did not attend weekly or biweekly meetings, results for abstinence were the same as those who did not go to support groups at all. An article from Scientific American, which examined the effectiveness of Alcoholics Anonymous (AA), reported that those who regularly attended support group meetings maintained abstinence for much longer than those who did not. A 16-year study following problem drinkers and AA attendance found that 67 percent of those who attended at least 27 weeks of AA meetings in the first year – or about one meeting every two weeks – maintained abstinence all the way through the 16-year study. In contrast, 34 percent of problem drinkers who did not attend AA meetings maintained abstinence in this 16-year period. Attending therapy sessions improved outcomes, too; 56 percent of problem drinkers who attended therapy maintained abstinence compared to 39 percent who did not. A combination of the two likely supports more complete sobriety and recovery, as peer support and therapy address issues from multiple angles. As technology improves, support groups are adapting to reach more and more people. Phone support groups gained popularity in past decades, but online support groups and forums are taking off now and helping people in remote areas, with uncommon conditions, or who simply do not want to leave the house. People who otherwise might be isolated due to their or a loved one’s condition can find common ground with peers all over the world. Ask a doctor, counselor, therapist, or social worker for help. Contact local community centers or religious organizations. Ask staff at a rehabilitation program. Talk to friends and family if they have gone through comparable searches. When searching for a support group, it is important to find an organization that matches individual needs and preferences. This may include gender-exclusive groups, such as male-only or female-only meetings. People who are parents in recovery from addiction may prefer their own, separate meeting. Adolescents may form a support group at school to help each other through recovery. Groups about specific substances, like alcohol, cocaine, or opioids, are also useful, since people recovering from these substances may be exposed to drugs in similar ways or experience similar withdrawal symptoms that need management. AA is one of the first forms of substance abuse treatment, founded in 1935 in the United States. Since then, the medical understanding of addiction has changed drastically, but AA remains important as one of the largest support groups available. For those who are not struggling with alcohol addiction or who do not want a Christian focus during recovery, there are dozens of other structures of support groups available. These groups strive to be free and open to new members, so finding a nearby meeting is usually easy. : This is an organization dedicated specifically to people of the Jewish faith struggling to overcome addiction. It is inspired by the 12 Steps and essentially follows the same tenets. Other group offerings to support those in recovery include Shabbos and Jewish holiday meals, lecture series from Jewish leaders, spiritual retreats, related support groups for family members, and group outings. : This group is also based on 12-Step recovery, but with a focus on Islam rather than Christianity. Both men and women can join support group meetings through this worldwide organization. Millati Islami has a structured meeting format that is easy to follow and focuses on guidance from the Qur’an. This is the first female-only sober group, also inspired by the 12 Steps. WFS uses 13 Statements instead of 12 Steps, however, and these are designed to encourage spiritual and emotional growth in attendees. Although there is a leaning toward spirituality, this does not take a specific religious form. Abstinence is the only acceptable goal for each meeting. Inspired by 12-Step programs, Self-Management and Recovery Training (SMART) aims to avoid Christian or religious language, but offer free meetings for peers working to recover from addiction. Instead of the 12 Steps, the program focuses on four points of recovery, worked on through face-to-face meetings as well as daily online meetings. SOS is yet another organization inspired by the 12-Step model, but with the intention to move away from Christianity and focus on peer support, recovery, and abstinence from drugs and alcohol. The 32nd anniversary of the group’s founding was in 2017. There are currently about 500 in-person support groups, as well as an extensive online support network. Each meeting is run slightly differently, based on who leads it, what the group’s needs are, and where they are located. Originally part of SOS, the group broke off to focus more on a specific set of self-help and recovery tools. Through meetings, LifeRing participants develop a personal recovery plan, and through discussions of occurrences in the past week, peers work together to reinforce good habits, recommend ways to destress or avoid triggers, and manage long-term sober goals. : Around for nearly 80 years, this international organization provides support group meetings for those in all stages of recovery who are seeking peer support and self-help training. The founding organization focuses on cognitive-behavioral techniques to manage stress and continue making positive changes, but the groups are not led by professionals trained specifically in CBT. Veterans’ benefits cover all kinds of medical care, organized through local VA hospitals. Support groups are an important offering, gathering fellow veterans to help each other through post-traumatic stress disorder (PTSD) and comorbid conditions, including substance abuse. A text conversation can do a lot to help those in the midst of an emotional or psychological struggle. 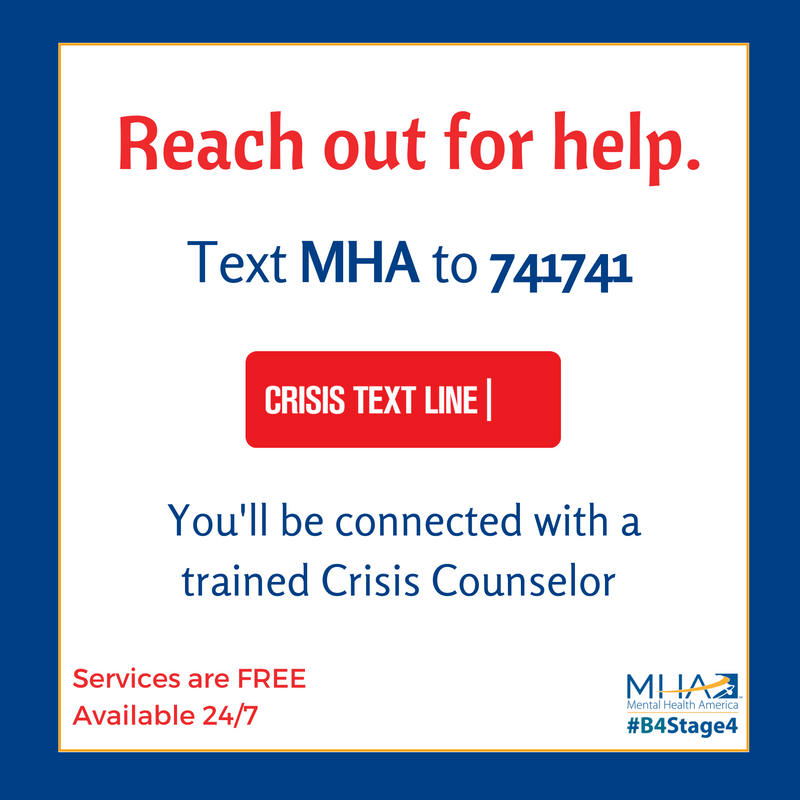 Start by texting MHA to 741741 and get a rapid response any time of day. These homes are rapidly gaining popularity as a step between inpatient rehabilitation and living completely in the outside world. States are beginning to regulate these homes, which typically house 10 or fewer occupants in a large house. The point of sober living homes is to support recovery by eliminating the presence of intoxicating substances while each person in the home focuses on getting a job or following an educational track. Many homes also require those in recovery to attend support group meetings and/or therapy sessions to sustain their focus on long-term health. For the most part, residents must attend these meetings outside the sober living home, but some meetings occur within the home itself, so residents get to know each other and build a sense of camaraderie.